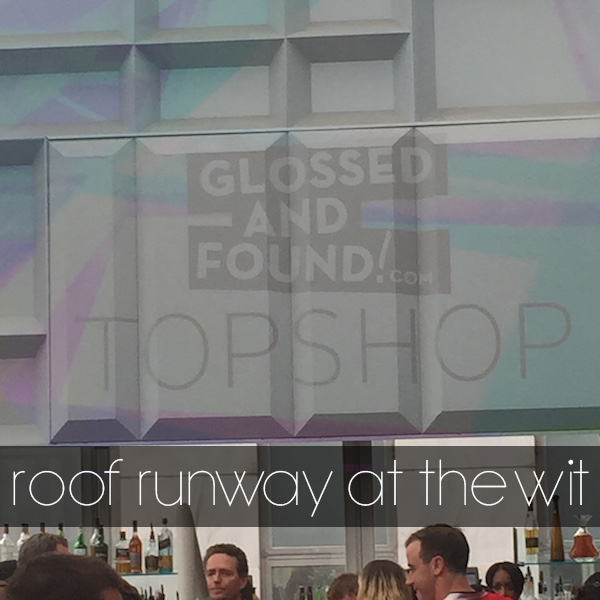 Last week I had a chance to check out the latest installment of the Roof Runway show at theWit! At first I was nervous that I wouldn't get inside after being told that the rooftop was over capacity. By the time I got upstairs, I realized that it was because it was filled with intoxicated Blackhawks fans who had no idea that a runway show was even going to be taking place. I totally understand their celebrating though.. don't get me wrong. I love how our city comes together when one of our teams win big! The show went by very quickly and featured GlossedandFound.com and clothing from TopShop. TopShop is one of my favorite stores ( I love their sale sections), so I was really excited to see these looks. Every outfit was awesome and I cannot express enough how much I am loving culottes right now! I need the cream pair that was featured in one of the looks ASAP. I was also really surprised by the males rompers that were featured in the show. What do you all think about guys in rompers? It didn't last more than 15 minutes, so I spent the rest of the time hanging out with some fellow Windy City Bloggers. I definitely think I would go back again to see the next show and enjoy some drinks after work!